It's interesting that when we began with a simple observation about WESS Digital's potential conflict of interest regarding Matthew Elliott's involvement in applying to the Electoral Commission in anticipation of the upcoming EU Referendum, it leads to further developments upon investigation. I have had no involvement in WESS since 2013, am not a shareholder and was never a director. 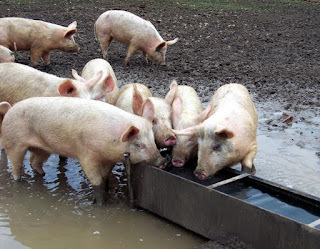 It also seems rather odd for a company which promoted its data services for the 2015 election "disabands" well before 2015 without any kind of significant turnover which we might expect from an active company - its accounts recording shareholders' funds of being just only £3,977. It gives an indication that our earlier assertion that it was being used as a company to become part of an anticipated early EU referendum and using its funding was not without merit. In addition we can see by Companies House records that the latest Company Accounts and the Annual Return are now overdue. We also see by the Annual Return that until very recently its address was registered at 14 Bowling Green Lane, London EC1R 0BD. This is the address which coincidentally happens to be the same address MessageSpace is registered with - a company well known as co-founded by Guido. WESS Digital's registered address of Bowling Green has been used since the establishment of WESS. It certainly puts a different perspective on Guido's comments of; "I have had no involvement in WESS since 2013". 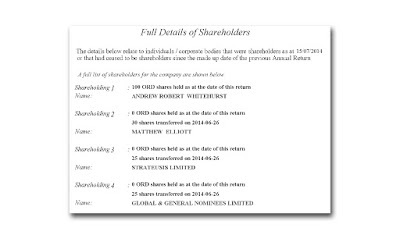 And by the recent Annual Returns we can see that two of the shareholders in WESS are companies. 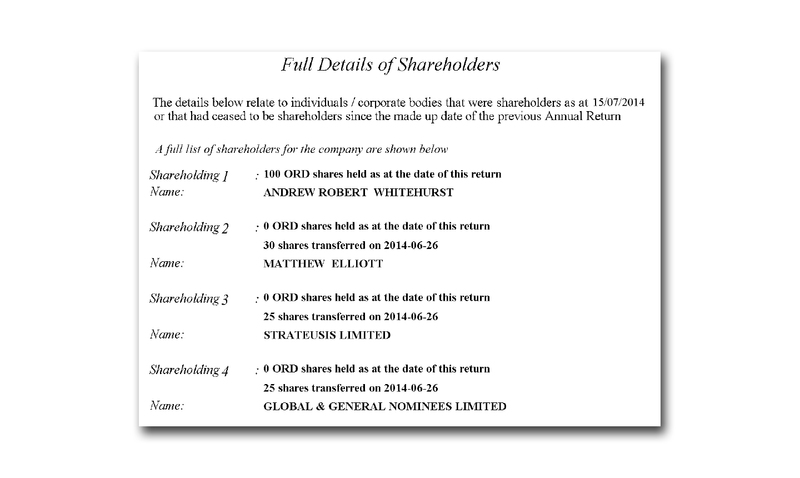 One such company shareholder was Strateusis Ltd the other being Guido Fawkes' Global and General Nominees Limited (GGN) which is an offshore company based in St Kitts and Nevis which publishes Guido Fawkes' blog. Guido Fawkes aka Paul Staines has previously described himself as only an "adviser" to GGN despite that GGN publishes his blog and that he is a director of a very similar named company Global and General Nominees (Hong Kong) Limited, registered unsurprisingly in Hong Kong. Strateusis Limited is also registered in Hong Kong and this certainly proves to be interesting. Jag Singh describes himself as the senior partner in Strateusis and it's revealing that a majority of so-called success stories listed on his website are companies he is involved with or has invested in with connections to Guido Fawkes. To give one such example is Youfundme Limited, listed on the website. This is a company with two directors. One director is Andrew Whitehurst who is currently (and always has been) the sole director of WESS Digital. What a surprising coincidence. The other director of Youfundme Limited is Voter Consultancy Limited. And Voter Consultancy Ltd has only one director, Thomas Borwick. Borwick also founded "Kanto Systems", which apparently is "a political data profiling company attempting to bring UK campaigning into the 21st century". Not unlike the raison d'etre of WESS Digital. Kanto Systems is a company where Borwick is co-director with his brother. But then we discover Borwick is also the registered owner of the website URL "campaigntoleave.com" domain with his address on whoislookup being given as as 55 Tufton Street, London SW1P 3QL. As Richard North, of EUReferendum.com notes 55 Tufton Street is the home of Business for Britain limited, a company which is currently listed with Companies House as "dormant". Of course any dormant company which carries on trading has the potential of attracting the interest of HMRC. Interestingly Borwick gives his e-mail as Thomas.borwick@nocampaign.org. The URL "no.campaign" domain, listed here, is a domain which is registered to one Matthew Elliott. It has an address given as Albert Embankment SE1 7XQ, which funnily enough is now WESS Digital's new registered address since the 15th September 2015 as per recent documents listed with Companies House. With this we can see clearly links between Jag Singh, Paul Staines, Matthew Elliott, Andrew Whitehurst and Thomas Borwick.